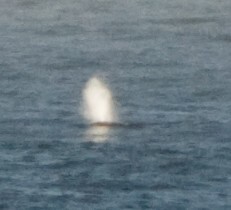 We went out yesterday to the Headlands to check out the whales, and we ended up seeing a bunch — we saw at least 6 pods in 30 minutes. Since the weather has been so beautiful lately — not to mention that there are over 20,000 whales migrating — they are easy to see as they steam past on the way to Baja. You can see them anywhere from shore right now, and the whalewatching boats out of Noyo can get you quite close. The Mendocino Headlands make a great location, as well as Point Cabrillo Light Station. The southern leg of the migration will continue for a few more weeks, and then we’ll start seeing the returning whales by March (they come back by for the Whale Festival, conveniently enough). 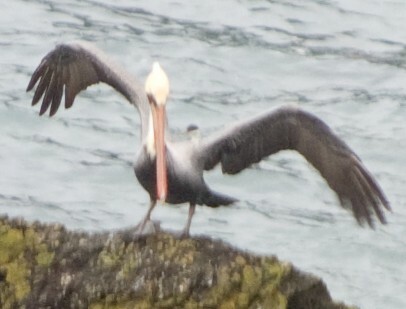 I’ve also been seeing a lot of brown pelicans lately. The picture is of a juvenile, according to a bird expert friend, since the bill is still orange, and his colors aren’t developed yet. I love watching them fly in a column just above the water! Join Mendocino Coast Audubon Society for their Spring Pelagic Trip on May 18, as they sail from Noyo Harbor in Fort Bragg aboard the Trek II (departing at 8:00 AM and returning about 3:00 PM). To reserve your spot, please mail a check, PAYABLE TO MCAS, for $95 per person to: K. Havlena – Pelagic Trip, PO Box 40, Fort Bragg, CA 95437-0040. Please include name(s) of participants, mailing address, telephone number and email address. For information call 964-6835.